Hello I am Michael Moonhunter. 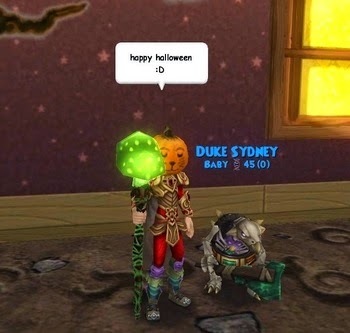 a blogger for my own site and today i want to talk about all the different hHalloweenthings Wizard101 and pirate101 has to offer for this grand holiday. The first thing they usually do is bring us Halloween quests and spooky bob which sells things like our own version of the black cat and witch outfits. This is special due to the fact that they brought in fishing and a new event for us that is kinda of a spin off to a awesome tv show. With fishing they have added three more different types of fish and the different type of fish you can catch are only if you do not know already, which i pretty sure you knew. On to the box event which takes place in a time machine and has two new chars in it the professor and it seems to be his ccompanion who only sells mounts. I have only gotten the Ravenwood mount next year i hope to get the other one. This is barely the start of what Halloween is in the spiral. Lets move on to the pirate side, which has a new mask set which i have gotten from Paige(Ty). The new mask is a unicorn or a horse mask which i thought was really cool how it look and how it was designed i give a thumbs up. They also added a black cat unlike it's Wizard101 counter part this one is more cat in real life and less firecat. There will be more in the future and i hope to post about those as well but until then keep reading this site and have a wonderful Halloween.